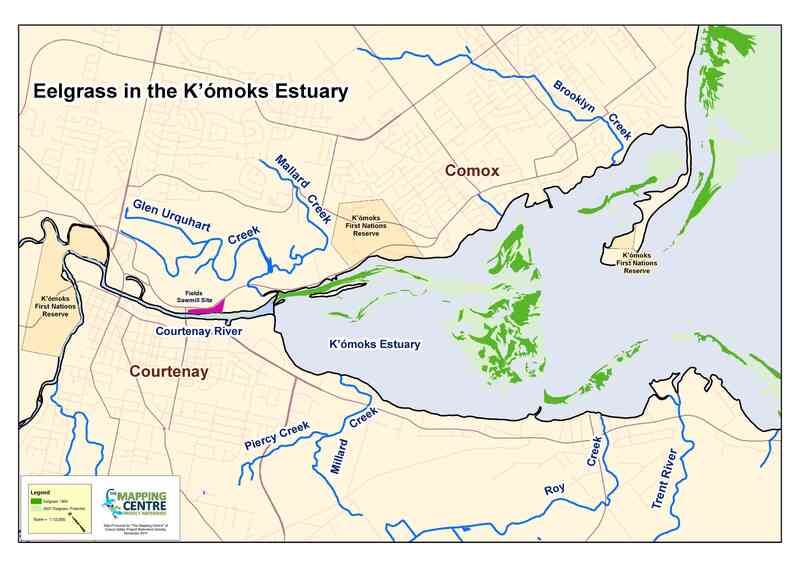 The K’ómoks Estuary includes all land within the 200 year floodplain from Reese Bridge on the Tsolum and Condensory Bridge on the Puntledge. The Esturay also includes land within 100 meters from the high tide mark out to Goose Spit and Trent River. 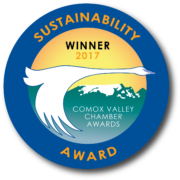 It is geographically divided into four distinct political jurisdictions with no common agreement as to how the estuary should be protected for future generations. This map shows eelgrass beds mapped as part of a 1995 study and potential eelgrass beds mapped from air photo interpretation of 2007 air photo’s. The Estuary Working Group is working towards restoring eelgrass beds as a component of our Blue Carbon project. 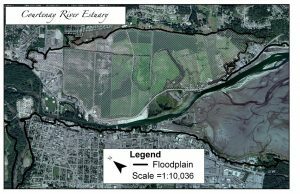 The white hashed areas in the map below are areas within the Courtenay River 200 yr floodplain that should be providing flood relief. Presently these areas are impacted by human activities so that this important function has been diminished. 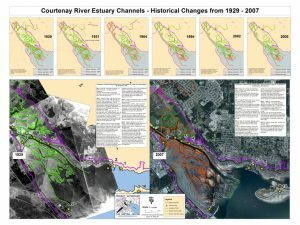 To read more about this phenomenon read Wayne Whites article The Flood Protection Function of the Courtenay River Estuary.